Satisfy your passengers with the XVM-H65 LCD monitor. This 6.5" widescreen TFT monitor mounts flush onto the headrest and is ideal for watching movies or playing games. 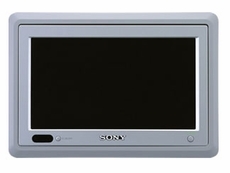 This monitor has two A/V inputs, one A/V output and comes with a power supply for the PS one game console. Flush mount bracket, IR headphone transmitter and wireless remote are also included. 6.5" Widescreen TFT active matrix montior for wide viewing angle. Supplied Wireless Remote (RM-X122), built in IR headphone transmitter, and SIRCS output for controling external IR devices. 2 Audio/Video inputs with internal switching capability and 1 audio/video output for adding additional monitors. Flush mount headrest bracket included, 1" depth for versatile headrest mounting, mounting plate included.